Cut the bread into pieces. Boil 1 Potato .Peel and cut into pieces. Heat oil and add mustard. When it starts popping, add asafetida and curry leaves. Add turmeric powder and chilly powder. Sauté well. Now add chopped onion and green chilly. Add salt to taste. Now add potato and bread pieces .Drizzle some water, and mix well. 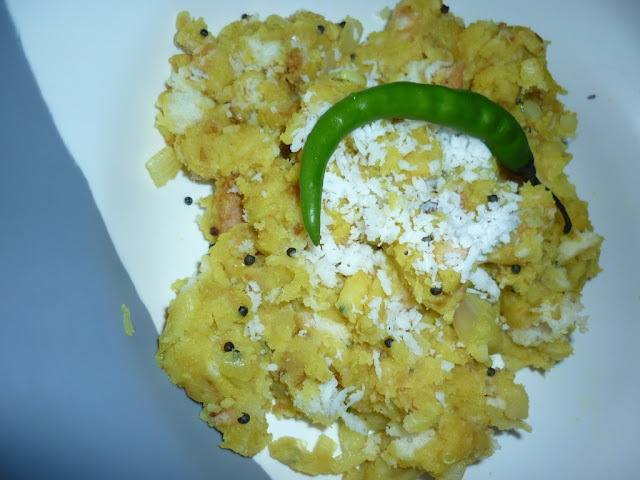 This Upma can be served with tomato ketch up and kids would love this. You can use whole meal bread to make it healthy. This quick and easy meal looks very tasty! yummy n delicious upma..I prepare this with the left over slices..
First time in your blog, you have maintain a great blog. Bread upma looks tasty and delicious. First time here and I enjoyed browsing around..